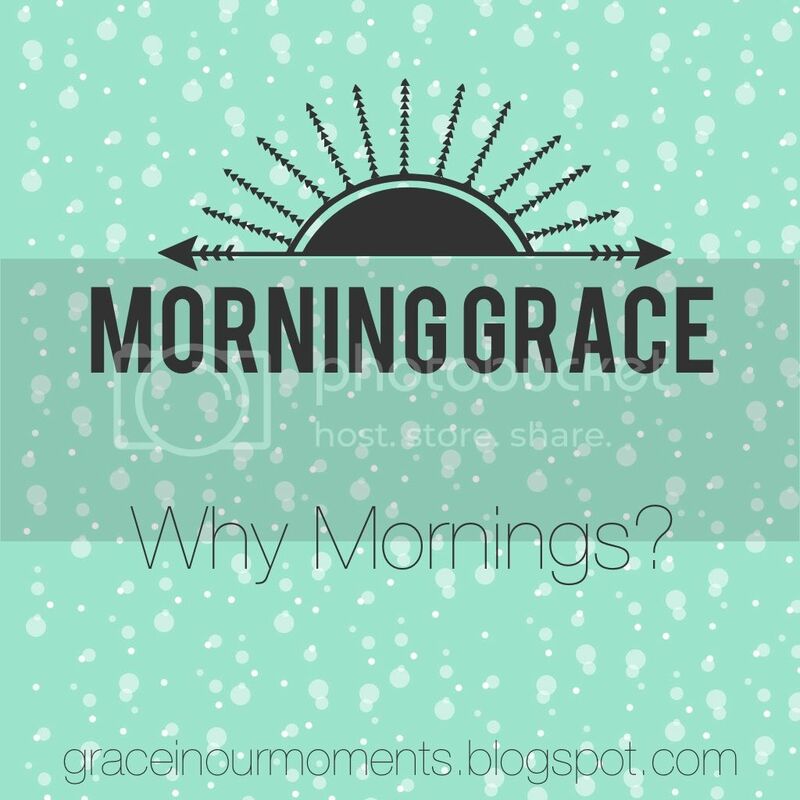 Grace In Our Moments: Why Mornings? My time with God has changed drastically through the years. As a young college student, I started spending time reading my Bible and praying each morning before class. I carried the habit into life as a young newlywed, having quiet time in our walk-in closet so my husband could sleep. (Don’t laugh. It was a huge closet.) Once our boys came along, I pretty much grabbed quiet time whenever I could. Now it’s come full circle, and I’m back to my morning times with God. Experience has taught me that nothing can beat those quiet early morning moments with God. Why mornings? Technically you have your time with God any time during the day, so why am I focusing on mornings? There are several reasons. 1. It sets the tone. When I wake up early and start my day with Bible study and prayer, I start my day intentionally. I start with a purpose: focus on God, and build everything else on that foundation. Time after time, God has used my morning time to give me exactly what I need, preparing me for the day ahead. Before I even know what I need, He’s already speaking encouragement to my heart. 2. It puts God first. Throughout the Bible, when God told His people to bring an offering or a tithe, He told them to bring the first fruits. He didn’t want the leftovers. He didn’t want them to throw in whatever they felt like giving. He wanted the first, the best, the sacrificial giving. When we give God our first time, before the chaos of the day begins, we truly put Him first. We give Him our time before we’re frazzled and exhausted, before our to-do list takes over, before work or family or commitments take our focus. 3. It gives me time to focus. My family does not like to get up early. After years of rising at 5:00 for college classes or early morning clinicals, I can’t sleep late. My body just won’t let me. I've learned to embrace it and use mornings for time with God. Early morning quiet time is perfect because there are few distractions. No one is calling or texting at 5:00 a.m. Everyone is sleeping. I can sit on our couch with my coffee and my Bible and really focus on God. When do have quiet time with God? I, too, love to get up earlier than everyone else and spend quiet time with God. It was certainly difficult when the kids were little (it seemed no matter how early I'd get up, one of them would get up that early, too, just to spend time with me). I am definitely NOT an early morning gal, but I need to be more disciplined in my time with God. It's great to hear other people's routines. Sometimes while I am making my coffee in the a.m., I will read a short devo on my phone. I like to chew on one really good verse, then later do more in depth research. Creating a Morning "Selah Space"